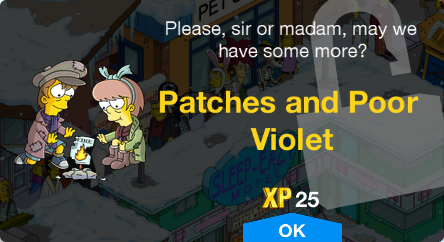 Poor Violet is an orphan who lives in Springfield. Her brother is Patches. Poor Violet had once given their only $1 of vitamin money to Bart, where he had carelessly used it. Poor Violet often has a cough caused with years of depression that has not been let out. Poor Violet has also claimed that she is very sick and wishes she can kiss people. When Ned Flanders and Homer open up a bible themed amusement park in memory of Maude. Soon many people suggest that they give the money the park's success is making to the orphanage. The money is never given to the orphanage because the park closes down. Patches and Poor Violet are both seen checking out of the orphanage. This section is transcluded from The Simpsons: Tapped Out characters/More Kids. To edit it, please edit the transcluded page. 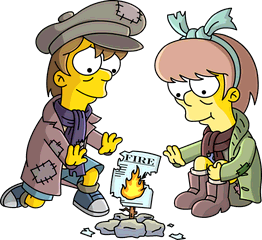 ↑ "Miracle on Evergreen Terrace"
Modified on May 5, 2018, at 08:15.